Today Credit Suisse confirmed our earlier assessment that the ECB will be shifting toward a looser monetary stance in the near future (see post). The depo rate to go to -0.1% accompanied by a token key policy rate cut in March or April. The threshold for balance sheet expansion has fallen. As shown [here] the ECB balance sheet has been contracting with accelerated LTRO repayments and is in stark contrast to the Fed and BoJ. 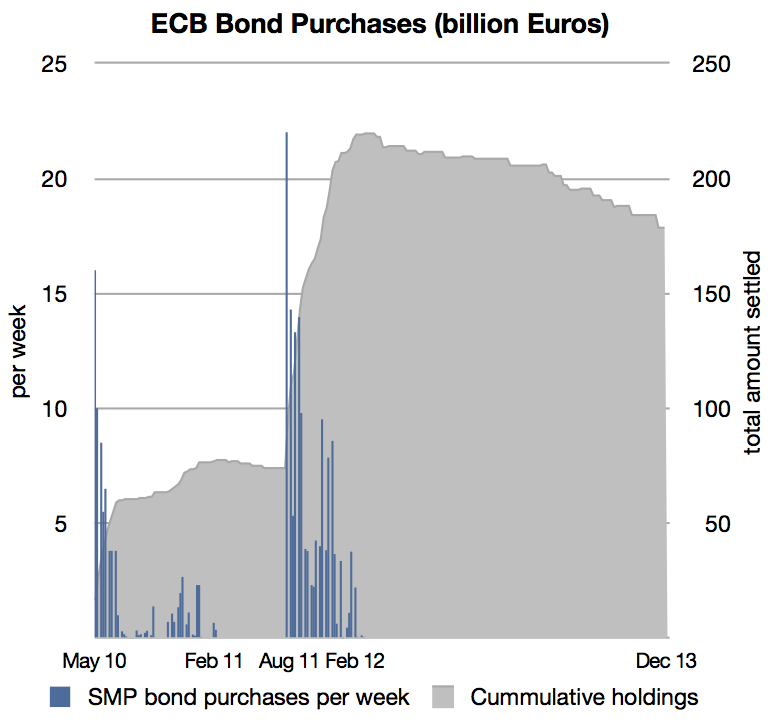 Removing the SMP sterilization (liquidity injection of €175.5bn) would be an effective way of providing stimulus and buys the ECB time to work out logistics of other measures. We would also see suspension of the SMP sterilization as a powerful signal that the ECB could engage in outright asset purchases if inflation continues to fall. What does CS mean by "suspension of the SMP sterilization"? Between 2010 and 2012 the ECB purchased over €200bn of EMU member states' government securities in order to help contain rising interest rates in the periphery nations (this included some Greek bonds that ultimately defaulted.) The program was called the Securities Markets Programme (SMP). Some bonds have since matured, leaving €175.5bn on the central bank's balance sheet. But unlike the outright securities purchases that the Fed, the BOJ, and the BOE have been undertaking, the ECB had "sterilized" its purchases by taking in the equivalent amount in term deposits. In effect the ECB funded SMP purchases with deposits it took in rather than with excess reserves as did the other central banks (discussed here). Many economists have argued that sterilized purchases run a lower risk of inflation than outright quantitative easing. What CS is suggesting is that the ECB can easily turn these sterilized securities holdings into outright QE by letting the term deposits mature, returning the funds, and not accepting any more deposits (stopping the Fixed Term Deposit auction process). That would automatically increase bank reserves by €175.5bn, resulting in a quick and a relatively large monetary easing action. While in the past the Bundesbank would vigorously object to such a move, given the disinflationary pressures in the Eurozone, CS believes it would not be an issue this time around.